Although some varieties of dessert grapes can be grown successfully outdoors, they are more successful under glass, even in warmer locations. With a little attention to watering, feeding, pruning and training, it is possible to get a good crop year after year. Double dig the ground and then incorporate a light dressing of well–rotted manure or compost, plus John Innes base fertiliser at 90g per sq m (3oz per sq yd). If the soil is waterlogged, dig a hole 75-90cm (30in-3ft) deep and create a 15cm (6in) drainage layer of brick rubble, gravel or similar in the base. Greenhouse vines should be planted at the opposite end to the door, with the stems trained along the side of the greenhouse parallel to the ridge of the roof and running towards the door. November and December are a good time to plant, as the vine can be pruned back without bleeding at this time of year. Vines should be planted at the same depth that they were in the pot, teasing the roots out so they are well spread out in the planting hole. For more detail on planting technique, see planting trees and shrubs. Just before growth starts in the spring, sprinkle the rooting area with John Innes base fertiliser and dried blood at a rate of 120g per sq m (4oz per sq yd) each. During the growing season, vines benefit from an occasional extra sprinkling of dried blood at 30g per sq m (1oz per sq yd). When growth starts in the spring, feed every three weeks with a high potassium feed, such as tomato fertiliser. Once the vine is in full leaf, increase this feeding to weekly intervals. When the grapes start to ripen and colour up, stop feeding with tomato feed, as extra feeding at this time may spoil the flavour of the fruit. Water the vine thoroughly every seven to 10 days in the growing season. Vines with the roots inside the greenhouse will need more frequent watering than vines with their roots outside the greenhouse. Where the roots are outside the greenhouse, be guided by the weather and concentrate your watering in dry spells. Just before growth starts in the spring, mulch the rooting area with well-rotted manure. During the summer, it is a good idea to mulch the greenhouse borders with straw to keep the atmosphere dry. This will aid pollination of the vine flowers and subsequent fruit set. Every three to four years, it may be necessary to ‘re-soil’ the rooting area during winter by digging a trench about 2m (6½ft) from the main stem, 60cm (2ft) wide and deep enough to reach any rubble put in to improve drainage. The soil removed from the trench should not be used on vines again, but may be used elsewhere in the garden. With a fork, gradually draw the soil away from the roots into the trench, working towards the stem. Empty the trench as necessary. Take care not to damage the roots during this process, and cover any exposed roots with damp sacking or straw to prevent them from drying out. Stop removing soil when you get 60cm (2ft) from the stem. Ensure that the roots are well spread out, and then backfill the trench with fresh topsoil. Firm well so that the roots make good contact with the new soil. Grape vines can be grown in containers of loam-based John Innes No 3 compost. Use a pot about 30-38cm (12-15in) in diameter and depth. Greenhouse grapes may require help with pollination when the vine comes into flower. At midday on a sunny day, when the atmosphere is dry and the greenhouse is well-ventilated, either shake the stems briskly but firmly, or stroke a cupped hand over each bunch of flowers, to transfer pollen between the flowers. The latter is a more reliable method for early-season Muscat type grapes, where pollination can be temperamental. Size, sweetness and quality of dessert grapes are improved by thinning the fruits with scissors. This encourages even ripening and discourages fungal problems. Vine scissors have long, narrow blades and are available from selected garden centres or mail-order suppliers. They are used to thin the grapes within each bunch. Steady the bunch with a small forked stick when cutting, as using your fingers spoils the bloom on the skins. Thin twice, first when the grapes are tiny, and then again when the grapes have increased in size. Bunches can also be shaped while thinning; aim to produce a perfectly proportioned conical bunch. Tendrils are thin, twisty stem-like structures that curl around supports to allow the vine to scramble and support itself. Remove these as they form, as they will only get tangled up with the fruits and allow the vine to scramble rather than sticking to your pruning and training regime. Diverting the plant’s energy reserves away from tendril production will also leave more energy for fruit production. Grape vines like well-ventilated, warm, dry conditions. Although heat is increased by keeping the vents closed, this will result in a build-up of humidity in the air that could result in fungal diseases and decrease pollination rates. It is therefore a good idea to keep the vents open during the summer and autumn, especially around flowering and fruiting time. Some greenhouse grapes, such as ‘Muscat of Alexandria’, benefit from extra heat, placing a small fan heater in the greenhouse during the spring (to aid growth) and during the autumn (to aid fruit ripening). See our pages on grape pruning and training for further detail. Vines can be propagated from hardwood cuttings in late autumn or winter. 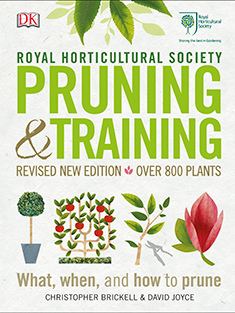 Softwood and semi-ripe cuttings can also be taken from late spring to mid-summer. Ones offered commercially are usually grafted. ‘Muscat Hamburg’: An early season black dessert grape with good flavour; performs well in an unheated greenhouse; needs assistance with pollination. ‘New York Muscat’ AGM: A black dessert Muscat grape with a blackcurrant flavour and good disease-resistance. ‘Schiava Grossa’: Also known as ‘Black Hamburg’. A reliable black grape with excellent flavour; performs well in an unheated greenhouse. Skins may break and rot if allowed to hang on the vine too long after ripening. Grape vines frequently suffer from a number of diseases. Of these, powdery mildew is perhaps the most common, striking in hot, dry weather or when growing in crowded positions with poor air circulation. They can also suffer from grey mould (Botrytis), downy mildew and the physiological disorder known as shanking. Wasps can be problematic, and it is a good idea to hang wasp traps nearby, especially with early-season grapes. Brown scale, woolly vine or currant scale and mealybug may be a problem.